Vivek-Mervin composed album for 'Mohini' has released under the Think Music label. The film/album has drawn considerable anticipation not only because its Trisha’s appearance after a brief space, it's essentially a horror flick and don’t we just love being scared. 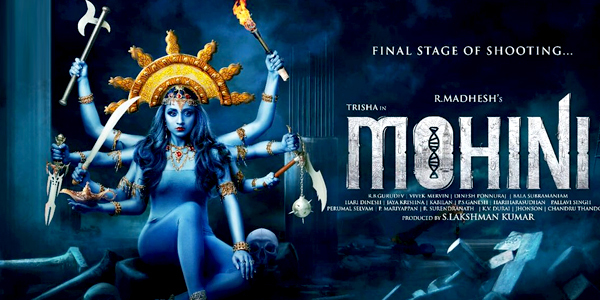 Only four tracks are out and it could've been better if we had the chance to get a taste of the background score/theme as its crucial keeping in mind 'Mohini' is a touted horror thriller. Vivek-Mervin has dished out a 'Hey' that screams 'pop culture' in parts and comes off highly listenable. With guitar licks accentuating the song at several junctures and easy lines to springboard the music, 'Hey' is instantly likeable. The beat pattern, the little rap portion towards the end and synth work in the track just gel pretty well to the flavour it sets to achieve. Make space for this in your playlist. You can't help but think how funky this party ode will be to Trisha. With Benny Dayal taking centre stage with his verve, the song is as throbbing with energy as much as it got that 'zing' to it. Bomb Figure Baby does not go out of its typecast peculiar to the genre yet is utterly cool and worth repeat hearings. An essential party song to tap your feet to. Vivek-Mervin nail it. The song is in its element right off the bat not giving way to unnecessary build up. Acoustic guitars riffs carry and springboard the number to the joviality it oozes. It is a little celebratory even. A clarinet break springboards the song intermittently with vocals that are neither jarring nor low key. Considerably a short track, it is equally enjoyable with all its antic references to social media. It's essentially a fun and jovial number that justifies its spot in the album. Mohini's Rage packs the anger within its notes to dish out a number that actually works out in the musical sense. The composer’s earnestness is just evident the way traditional and western elements have mixed in the right proportions. It gets a bit conventional midway bordering on languid strokes of fast notes and succession. The deliberate hurry however falls to the much famed Aigiri Nandini devotional calibrated exceptionally. Only wished that part lasted longer.